The latest installment in an ongoing series of excerpts from The Fundraising Field Guide, by TrueSense Marketing. Before launching your exploration of direct-response fundraising’s great frontier, let’s consider where you’re headed. What will success look like for you? More revenue to meet your mission? More donors to fuel that revenue? A Board of Directors happy with their return on investment? Improved brand awareness? An expansion of your programs? All of the above? The truth is, for most nonprofits, success looks like all of these things — and more. But more important than metrics, success looks like a world with hope restored, bodies healed, families fed, elderly lives brightened, veterans honored, animals defended, nature’s delicate balance preserved, and more. At TrueSense, like most fundraising agencies, we continually monitor our clients’ “data points” for signals of growth and/or risk. But in a larger sense, we see our job as creating connections between a world in need and the people who want to fix it. As a result, success can often come from a core belief: Heroic human hearts can help heal the world. That’s why we position our clients’ donors as heroes when we appeal to them for support. When we thank them for a gift. When we ask them to step up in emergencies. And when we affirm their heroic actions with heartfelt thanks. We also believe that heroic donors are nourished by the act of giving, which satisfies an essential human need. In fact, this belief is supported by brain science, which confirms and explains the gratifying sensations that we humans derive from acts of charity. Your best outcome is one that addresses virtually any “data point” goal in your growth plan through a growing corps of heroes who fuel your mission. Getting there is the challenge. Hero, Hero, Where Art Thou? As organic as the trait of human charity may be, heroic donors do not simply sprout from a fertile fundraising field. They must be cultivated. 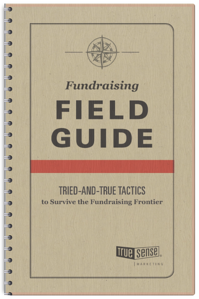 That’s what this Field Guide is all about: methods, disciplines, strategies, and tactics across a variety of programs and channels designed to grow your donor file. Before you dig into strategic and tactical planning, however, it is useful to understand the dynamics of donor growth. If you are like most nonprofits, you harvest your donors from a universe of prospects. Depending on the nature of your mission, that universe may differ greatly from that of other nonprofits. But there are basic truths about giving behaviors that lead to donor growth, regardless of an organization’s size. You may know, for instance, that they are responsive to direct-response fundraising appeals. You may know they are responsive to organizations with missions similar or parallel to your own. You may know they attended one of your events, or visited your website, or live in a community directly impacted by your programs. You may know they have an affiliation with a belief system that you share. These indicators, and many more, suggest you could be a match for their charitable activity! And if you’re successful, you will welcome these new donors to your family. That search for new donors does not come without a cost, of course. That’s why acquisition programs usually “lose” money — because your new donors’ initial gifts generally do not cover the cost it took to find them. At this point, your newly minted donors are not yet heroes, as we define them. As they enter your giving programs, their relationship to you is purely transactional. Their commitment to you begins and ends with the act of contribution. You have made a persuasive case for support, and they have responded by writing a check or authorizing a credit card contribution. They may have even responded to a subsequent appeal or two, and by now are actually showing a “net positive” revenue flow. This is good news! But their giving is still restrained, and their loyalty is vulnerable to similar appeals from similar charities. Your relationship could hardly be termed a commitment. This seems like a good first date. But what happens next? That has a lot to do with understanding what makes heroic donors different than purely transactional contributors. Unlike purely transactional contributors, heroic donors want to make an impact, to control their gift amounts and frequency, and to control the rate they hear from you. Therefore, heroic donors are shown recognition and gratitude, asked for feedback, and listened to and respected. Knowing this, you should make these preferences available to your donors. In return for their commitment of support to your organization, offer them the chance to limit or control the way they hear from you, how often they hear from you, and what they hear from you. Give them a chance to set their giving amounts, the frequency of their gifts, and the channel through which they prefer to transact their giving. Convince them they are the key to the solution. Keep them informed of their continued impact (even if that information comes to them without an ask attached). Give them an opportunity to give feedback and respond to questions. And above all, thank them promptly, personally, and profusely for their support. In return, heroic donors will: retain at a high rate, build enormous lifetime value, and deepen their relationship and worth with you. In this way, these very special donors go beyond the first date and can no longer be considered transactional. 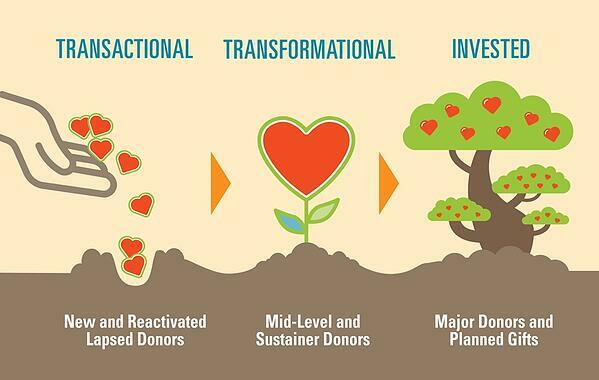 Heroic donors enjoy a transformational relationship with you. They have committed to you and your cause. And hopefully, in return, you have committed to them your respect for their expressed preferences. Once this transformation takes place, the likelihood of them making transformational gifts (major gifts, bequests, DAF investments, etc.) becomes much greater. To be clear, by these definitions, not all heroic donors are (or have the capacity to be) high-dollar donors, but virtually all high-value donors are heroic. Their relationship with you will have successfully grown from purely transactional to one that is truly transformational. The Salvation Army’s unique identity and history has attracted heroic donors since the organization was founded in 1865. William and Catherine Booth, the founders of The Salvation Army, traveled across England preaching and raising money for their mission, and attracted a movement of people in and outside the organization who shared their vision for transforming the lives of the poor and lost. Evangeline Booth, their daughter, carried on their legacy in the United States and established The Salvation Army as a bedrock organization in this country. Her tenacity broke down barriers and paved the way for the organization’s service on the front lines of World War I and II. Theirs is a legacy that still motivates transformational giving today, a century after the “donut lassies” set up their tents right behind the frontlines to help servicemen. The organization’s work doesn’t end on Christmas Day, and need knows no season. The Salvation Army meets the core needs of people in the community, and that they provide food AND a place to learn and grow emotionally, physically, and spiritually. The organization is a good steward of donors’ giving through the sacrifices of its Officers and cost-effective practices in its programs. Faith is a powerful guiding force in its commitment to meeting human needs without discrimination. We measure success in growing the number of heroic donors by their retention, and in giving commitments for three or more years and whether the number of these donors has increased. We also measure success by their understanding and commitment to The Salvation Army’s fundamental promise: to go boldly into places where the need is greatest, and to find cost-effective solutions to the challenges they find in those places. In a world with thousands of new charities and the distractions of a thousand screens, it has become even more important to find and create bonds with donors that are transformational. This is a vital part of your fundraising journey. Survival requires that you stand out and make good on your promise to your donors. framed by basic human behaviors and motivations.